Ron Gilbert may have a list of game credits that boggles the mind, but is best known for a handful of stone cold classics. We're not referring to the recent The Cave - which was a solid game itself - but are going way back to the glory days of LucasArts and point-and-click adventure games. Gilbert was involved in a number of the top games in this genre in the late '80s and early '90s, with the Monkey Island titles being among the very best. Gilbert was partly involved in the Telltale titles that we saw on WiiWare, but wasn't leading the project. LucasArts was part of the broader range of George Lucas' businesses bought by Disney, so as a result it's now Mickey's company that has ownership of the series. Gilbert has tweeted that he's still interested in buying the rights to the IP, something he's also said to varying degrees on multiple occasions in recent years. The question could come down to money, Disney's own plans for the IP (Gilbert has said he fears it could gather dust) and various boring business factors. For our part it'd be wonderful to see the series revived with Gilbert at the helm - though the Telltale series is how some younger gamers know the franchise, the originals are outstanding and delightfully funny games that deserve a Gilbert sequel. Gilbert - it should be noted - is keeping himself busy, as he's currently involved in a new point-and-click adventure game called Thimbleweed Park. 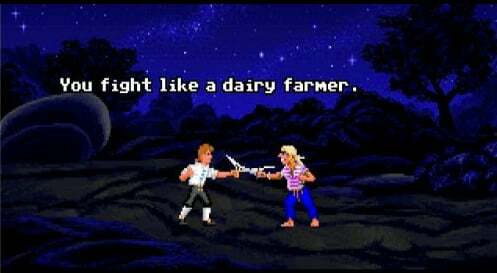 We won't hold our breath for more Monkey Island, but would love to go another round of Insult Sword Fighting. Yeah...It'd be really awesome for another Monkey Island game. But its Disney...what chance does he have to get back the rights? Sure, Disney may not be into gaming anymore but that doesn't mean it won't be interested in the series...who knows, they'll end up making a live show out of it. Still love Curse of Monkey Island! You can't win. Not against Disney. I just want a remake, or rerelease, of Monkey Island 3. For the love of god! Every other Point and click game gets that treatment, but not Monkey Island 3! Disney selling an IP back to the creator? Has this ever happened, historically? Disney isn't giving out licenses. They have licenses for hire if Disney don't care. Disney didn't care for Star Wars games, and is why EA bought the exclusivity. Disney is unlikely to sell the IP, but I could see them letting Ron Gilbert make a new game. It would be very low risk from their point of view. If he makes a hit game then the IP is revived. If it flops then no big deal. It is not like they are trying to do anything with it themselves. Point and click adventure games are my favorite. King's Quest and Space Quest are amazing. I wish there were more of them on the DS family since the system is practically built for it. I would like Monkey Island stuff to appear in Disney stuff like Kingdom Hearts, but if someone actually making more games is an option, that's even better. As long as they don't fall into the hands of Schafer, im fine with that. @Pod actually it has, Saban bought back the Power Rangers in 2010. Surprised to see this news here, but more awareness is always good, I guess. Hope Gilbert gets it back someday and not take the true secret of monkey island with him in his grave. @TossedLlama orly? you fight like a diary farmer. if it means we finally get a curse of monkey island release on console or steam then i will be happy! I've heard that he wants to reboot the storyline of the three latter games since he wasn't directly involved with them. I don't know if I want him to make a new Monkey Island game if he's going to do that. Doubt Disney cares much about selling anything at this point and probably don't even realize some of the properties they own now from gobbling up so many companies, but it would be nice for Gilbert to be able to continue the series. I just hope it's not going to be like Escape from Monkey Island. That game was awful. Every one before it and even the telltale series were great. Also agree we really need Curse of Monkey Island Special Edition already. I fear Disney would rather let the IPs rot than go through the effort of selling them.